Terms of Purchase | United Business, South Africa. You may offer to purchase all items on this Website which are priced and United Business Solutions will in response to your offer issue a pro forma invoice and the sale will be concluded upon you authorising payment of the invoice. In respect of those products which are not priced on the Website, you may request a quotation and a sale (or rental) will be concluded upon you accepting the quotation. United Business Solutions will always be entitled to cancel any sale if there are insufficient stocks or if a product has been withdrawn from the market and in such United Business Solutions will forthwith refund any payment made by you. All prices quoted include Vat and are quoted in South African Rand. Payment can only be made on line by means of a credit card or a electronic funds transfer. In respect of those items where you have requested a quotation, the payment terms and the method of payment will be detailed in the quotation. Goods will be delivered within seven to fourteen working days from the date of the conclusion of a sale contract or in the case of a quotation the delivery date will be specified on the quotation. You will be liable for any redelivery expenses (including storage and insurance) if you fail to receive products at the time of delivery. United Business Solutions will not be liable for any damages, consequential or otherwise, for failure to deliver timeously. The risk in the goods will pass to you on delivery and ownership of sale goods will pass upon payment of the purchase price. United Business Solutions shall not be liable for any damages consequential or otherwise for goods which are delivered which are defective or damaged. Provided notice of defective or damaged goods is given by you within seven days of delivery of the goods, United Business Solutions may elect either to refund the price of the damaged / defective goods or to exchange the defective / damaged goods for new goods. United Business Solutions guarantees that at date of delivery all products which are sold will be free of defects caused by faulty component or faulty workmanship during the manufacture thereof. This warranty will be valid for a period of twelve months from date of purchase and United Business Solutions may elect, in its sole discretion, whether to repair or replace the defective product. After replacement or repair of the product the warranty will apply only for the remainder of the warranty period and will not extend beyond such original warranty period. The warranty only applies within the Republic of South Africa. All claims for repair or replacement will only be accepted if the defective product is delivered to an appointed service center accompanied with a valid purchase receipt. The warranty is not transferable without the prior written consent of Untied Building Solutions. The warranty does not apply to consumable items or to accessories such as styli, bulbs, AC adaptors, batteries, dust covers, dust bags, belts, brushes, video tapes, cabinet parts, epoxy coatings, glass / ceramic turntable platters or any other accessories. United Business Solutions will not be bound by any other warranty unless expressly stated on the pro forma invoice or the quotation. United Business Solutions shall under no circumstances whatsoever be liable for any loss of profit or any damages, direct or indirect consequential or otherwise sustained by you and arising from any transaction between the parties through this website. 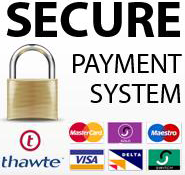 United Business Solutions is backed by VCS's Secure Payment Gateway and makes use of Secure Socket Layer encrypton technology (SSL) to protect your personal information or credit card details as it travels over the internet. However, there is no guaranteed security of transmission of data on the internet and therefore United Business Solutions does not guarantee the absolute security of information you transmit to us or which we transmit to you. You warrant and agree that your login name and password shall be used for personal use only and not be disclosed to any third party and you undertake to take the necessary precautions to prevent this information from being unlawfully used. All information of all United Business Solutions customers will be kept confidential and not be shared.